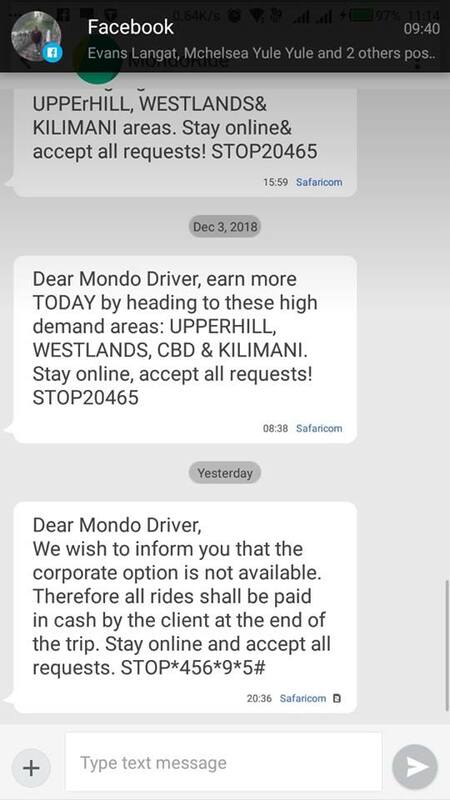 Middle East taxi hailing app Mondo Ride has exited the Kenyan market silently, and in the course vanished with millions of shillings belonging to taxi drivers allied to the app. According to sources, the drivers started complaining after they realized their service providers were not paying their dues, thereby organising a strike before being informed that the suppliers had fled the country. The company had corporate clients like Equity Bank, Cytonn Investments, DSTv, PKF, Nairobi Hospital and Liquid Telecoms. On February 11, drivers were treated to a message informing them that corporate options were not available, and that riders should pay at the end of the trip. Efforts to reach managers were futile as all their phones were switched off. As of February last year, the company had a total of 6,000 drivers in the five African cities where it operates. The five cities include Nairobi, Mobasa, Kisumu, Kampala and Dar-es-Salaam. “This funding round will enable Mondo Ride to provide even more rides for busy, active people across the fastest growing cities in Africa. We currently have operations in five cities across Africa, and plan to open six new cities by the end of 2018, significantly increasing ride numbers,” said Mondo Ride CEO and co-founder Troels Andersen . Kahawa Tungu learns that the company could have exited all the East African countries including Tanzania and Uganda. It is alleged that they closed shop when they realised drivers had formed a Whatssap group and were to match to their offices yesterday. Last year, the company announce that it had raised over Ksh203 million ($2 million) in an expansion that was never to be. In July 2018, Mondo Ride introduced parcel delivery services in a bid to resuscitate its dwindling fortunes, but the business was suffocated by existing service providers. The service would cost customers Ksh150 for 7kilometre distance and an additional Ksh30 for every kilometre. This was expensive considering that parcel delivery across cities in Kenya is as low as Ksh200. Mondo Ride was founded in Dubai but is headquartered in Nairobi, since 2016, but has failed to break even despite capital injections from various investors like ISON Group, a Lagos-based IT firm that operates in 25 countries. Drivers allied to taxi hailing apps have been complaining of a surge of prices that favour the riders, while drivers get little income.